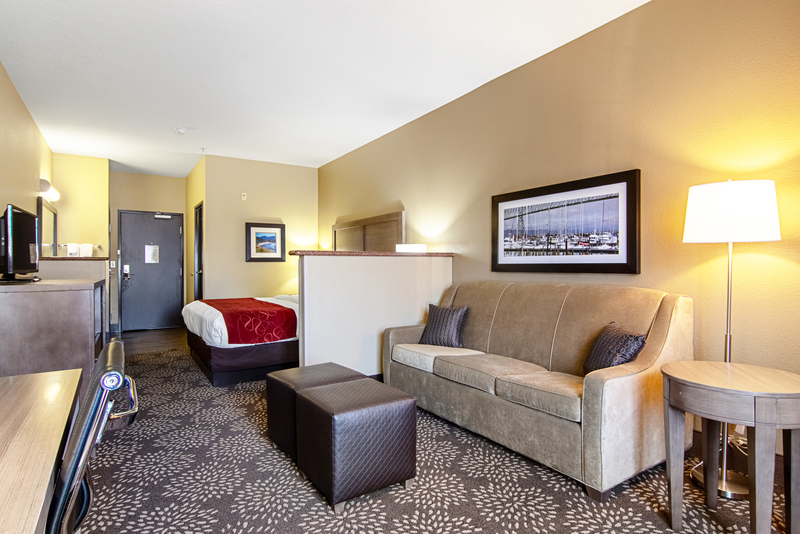 Relax in our spacious and charming hotel suites after a busy day of leisure or business in Astoria, Oregon. 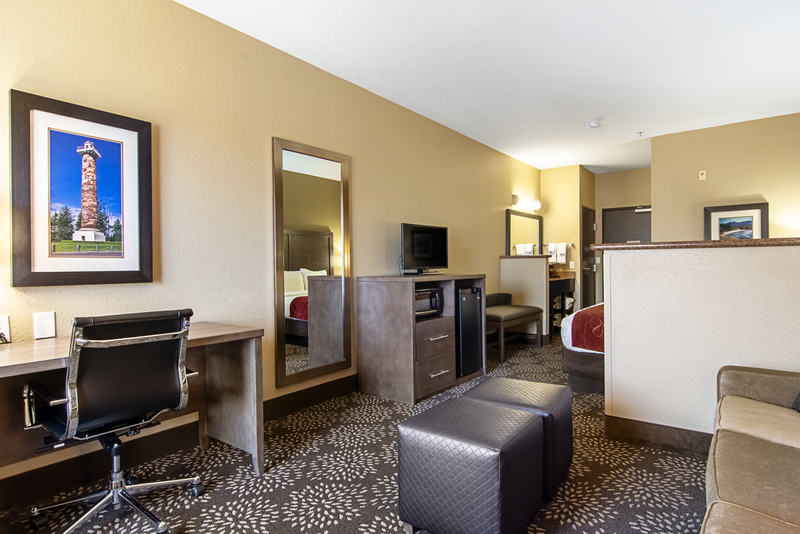 Overlooking hillside or river views, our Comfort Suites accommodations offer free wifi to help you stay connected to home or work, and you'll be able to enjoy free HBO and movie channels from the comforts of your bed! 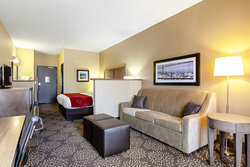 Choose the Astoria Oregon hotel room suite that's perfect for you! Our versatile accommodations range from One King Bed Efficiency Suites, Two Queen Bed Suites, and even Whirlpool Suites - perfect for unwinding! Don't forget to bring your furry pal to Astoria - our Riverwalk hotel is pet-friendly and features accessible suites. This One King Bed Suite features a comfortable pillow top bed. 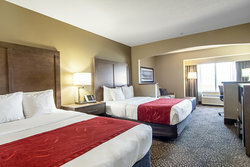 Kick back in the comfort of a king sized bed, enjoy complementary HBO and movie channels, chill refreshments in your personal mini-refrigerator and stay connected with free high-speed wireless internet. 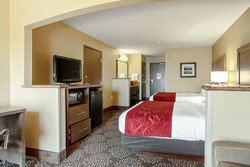 This One King Bed Suite River View features a comfortable pillow top king bed. Our One King Bed Efficiency Suite features a plush king bed and Kitchen with a hillside view. Stretch out in the comfort of our One King Bed Efficiency Suite and enjoy all of our customary in-room amenities such as free Wi-Fi & local phone calls, an ergonomic desk chair & desk, and multi-outlet/USB charger, in addition to a kitchen. You'll enjoy the privacy of a separate bedroom. Perfect for a longer or extended stay! Our 2 Queen Bed Suite boasts two comfy pillow top beds. This suite is equipped with in-room amenities to make your stay especially comfortable. A personal microwave and mini-refrigerator, free wireless Internet and complementary HBO & movie channels await you! What’s more? 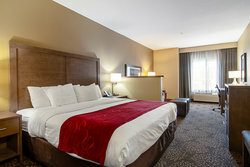 Enjoy it all from the comfort a two queen beds! 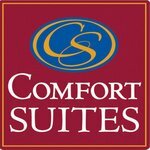 Crave comfort in your hotel stay? Feel at home and enjoy the convenience of having your own personal microwave and mini-refrigerator, kick back on a comfy bed - or two - with free HBO and movie channels. This Two Queen Bed suite features two queen beds and one Sofa Bed with a river view. Enjoy the convenience of having a personal microwave and mini-refrigerator, kick back on two comfy queen beds with free HBO and movie channels and stay connected with free high-speed Wi-Fi access and free local calls. Complete with a sofa bed, this room accommodates up to 5 guests. With visual alarm and doorbell alert this suite is equipped with everything you need to guarantee a comfortable stay. And, there's more! Take advantage of free wireless internet access, complementary weekly newspaper, and your personal mini-refrigerator, microwave and coffee/tea maker. The Two Queen Accessible Suite is mobility & hearing accessible, with a Roll-In Shower and river view. Double the beds, double the comfort. 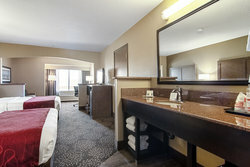 Fully equipped with a roll-in shower, our Two Queen Accessible Suite is complete with visual alarm and doorbell alert. Expect to have everything you need for a comfortable stay and more! Take advantage of free wireless internet access, complementary weekly newspaper, and your personal mini-refrigerator, microwave and coffee/tea maker.